Traditional rhythm games give players a series of set songs to tap along to. 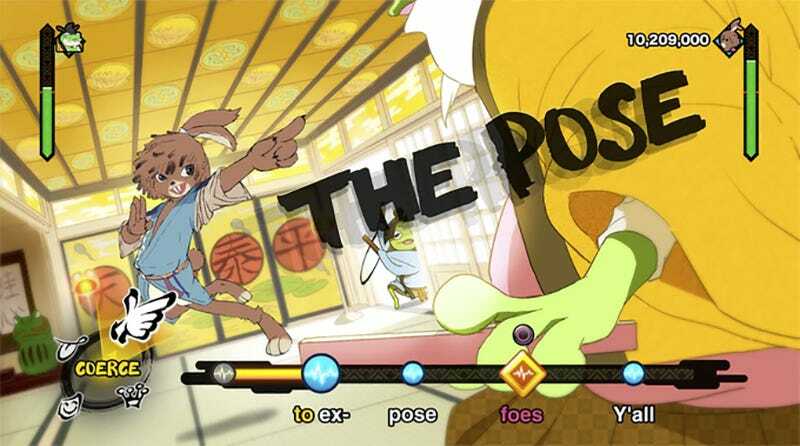 In Project Rap Rabbit, the newly-announced collaboration between Parappa the Rapper’s Masaya Matsuura and Gitaroo Man’s Keiichi Yano, players participate in rap battles powered by RPG-style dialogue trees. According to the Kickstarter video for Project Rap Rabbit, the battle system in the game was inspired by the sort of dialogue trees found in many modern role-playing games. Rather than simply tapping along to a song and being scored for their accuracy, players will use an emotion-based dialogue wheel and keywords to counter their enemy’s lyrical assault. Battles play out in three steps. First, the player listens to their opponent’s rap, during which specific keywords will be highlighted. Then the player chooses which of those keywords to run with and which type of lyric to bust back at their opponent—boast, laugh, joke or coerce. Finally their rap plays out, and they tap along with it for maximum impact. In the video Matsuura explains that one of the criticisms weighed on the Parappa the Rapper series was that it was a rhythm game and not a ‘rap game.’ With Project Rap Rabbit, the creative dup believes they’ve created a true rap game system. You can learn more about Project Rap Rabbit over at the European PlayStation Blog. The Kickstarter project for the game launched today, looking for more than a million dollars to make it happen in August of 2018.